This coming festive season, i.Tech and Mobile Concepts (M) Sdn. Bhd. will brings colourful Bluetooth headset to you and would be ideal for Christmas gifts. The VoiceClip 609, retains the clip-on design from its predecessor, but with added new features to boasts multipoint technology, which lets the unit simultaneously connect to two mobile phones, and Clear Voice Capture (CVC) technology for noise and echo cancellation. Recently, i.Tech has brought a few models to the end of life from its production line, namely the Clip Naro 601 and Clip II mini. The VoiceClip 609 will offers you a new lease of comfort, clarity and user friendly interface while using i.Tech’s product. i.Tech VoiceClip 609 will be selling at a recommend retail price of RM148.00 and will be available at retail stores nationwide soon. Besides this model, MCM also have the magnetized clip with in-line microphone VoiceClip 604. Stay tune for more information on the availability of i.Tech VoiceClip 609. VoiceClip 609 is a trademark of i.Tech Dynamic. Other names may be trademarks and/or registered trademarks. Mobile Concepts (M) Sdn. Bhd. has joined the micro-blogging world. Follow us on Twitter, if you’re from Malaysia and love to know about the latest range of genuine mobile accessories. We are new on the Twitter-sphere and we would like to get feedbacks from our product users on i.TECH, KINGMAX, NOKIA Original accessories, Sony Ericsson genuine mobile accessories, Sony M2, Kempler & Strauss and iNO Mobile. Please follow us on Twitter and we will try our best to follow you back. "iNO Mobile Launching Special Promotion"
In conjunction of Consumers Electronic Digital Lifestyle Expo from 10 - 12 December 2010, iNO Mobile will officially launch its products into Malaysia's market at Kuala Lumpur Convention Centre. On the 11th December, iNO Mobile will have a representative on stage (at Mobile & Broadband section in Hall 1, starts at 2PM) to give a speech and brief the media on the concept of the iNO Mobile compare to other top mobile phone brands in Malaysia. The key concept of iNO Mobile is "SOS" button feature. When the user press and hold the "SOS" button, the siren alert sound will be play from the phone. Not only that, the iNO Mobile phone will automatically blast the SMS and call to the emergency contacts number that had been set. The siren sound will be stop once one of the emergency contact has answered the call. (for more information regarding this features please visit www.inomobile.com). 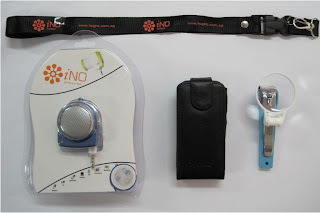 iNO Mobile key target market are for the elderly (senior citizen) 55-years-old and above. During the launching, AGIS, a leading navigation and location-based services (LBS) will also introduce their collaboration with iNO Mobile to provide a better A-GPS services to the consumers. Our elderly parents or grandparents are precious to us. However, in emergency situations when they are unable to communicate, he or she may trigger an alert by pressing the SOS button built into this iNO phone. All family members in the SOS contact list shall be alerted with location information via SMS. Family members in the SOS Contact List are alerted and can attend to them immediately. AGIS will able to identify the location of the particular mobile phone based on the GPRX solution. Let's join the iNO Mobile at DLE to find out more on the concept of "SOS" and other features at Hall 1 booth number 107. For the daily first 50 customers, there will be a special goodies bags (as shown above) awaiting you for each iNO Mobile purchase. To find out more, stay tune at Mobile Concepts (M) Sdn. Bhd. blog. i.Tech introduced stylish portable Bluetooth stereo headset MusicBAND 807, bringing high-quality music listening results. Users enjoy favourite songs without missing calls - the button on the right ear cup allows users to seamlessly switch, answer phone calls. MusicBAND 807 is a portable wireless Bluetooth stereo headset, belt design comfortable and stylish, i.Tech unique audio technology to provide high-quality sound and rich and vigorous sound. In addition, the headset supports Bluetooth stereo audio transmission profile (A2DP), allows users to stream from a compatible A2DP Bluetooth mobile phone or music device of the songs. Once paired with the headset, mobile phone or music device can be used to control music playback. The headset also supports Audio / Video Remote Control Profile (AVRCP), users can remotely control the music playback mode, for example, choose the next or previous one. When a call came in, the music automatically pauses, the user through the headset button to answer or reject calls, the call automatically switches back to the end of the previous music. Easy to operate - user can adjust the volume control keys, remote control music playback and answer or end calls. MusicBAND 807 also features noise reduction and echo of the Clear Voice Capture (CVC) technology and integration to shorten the gap with Fast Stream audio technology to ensure the user without delay to hear the sound from the audio source. MusicBAND 807 has a long cell phone battery life, providing 10 hours of talk time, 7 hours of music playback time and 350 hours of standby time, and in less than 3 hours fully charged. MusicBAND 807 comes in two colours of black and white, with a stylish portable protection carrying case. Check it out at Mobile Enhancement Store Plaza Low Yat 1st Floor or any retailers nationwide. The recommended retail price for MusicBAND 807 is RM238.00 and carry a limited 12-months warranty by MCM. i.Tech is a trademark of i.Tech Dynamic. Other names may be trademarks and/or registered trademarks.